By Susie Ellis, SpaFinder Insider. Those of you who read my blog regularly know I try not to do too much self promotion. I would rather share with you what I learned at a TED conference that might affect the spa industry than point out a SpaFinder deal or a Global Spa Summit promotion. Afterall, I do appreciate those who follow my blog and want to make sure I am giving you valuable information that is good for you and your business. Today however, I am going to make an exception – so please forgive me. 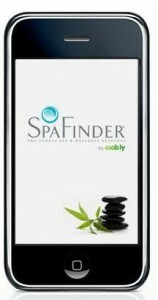 I feel that I just have to tell you about the new SpaFinder iPhone App that just launched because it is so cool and so exciting that there frankly isn’t anything else of greater importance. The spa industry is really on the map – literally! We are really quite emotional about it here in our New York offices. Everyone is going around the office sharing iPhones with others so we can all give the new App a test drive. The excitement is pretty contagious! 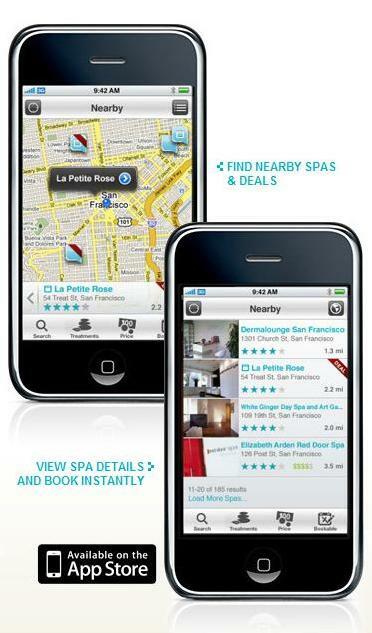 The SpaFinder iPhone app is in the iTunes store (It’s free by the way). This is how it works. You download the App to your iPhone, open it and immediately you see all the SpaFinder spas in your area (my map shows around 20 of them). There is a red banner on some of the spa icons – those are the spas that have a special bargain deal going on today. I can then select any spa to take a closer look – check out photos, read the overview, see the list of treatments, reviews, etc. Then I can either contact the spa via phone, email or in a lot of cases I can select a particular spa service and time of day and book it right there and then! It’s so amazing to see all of this come together and I am really grateful to the entire team here who made it happen. Special thanks should go to Daniel Lizio-Katzon, our VP of Spa-Booker, who spearheaded the project and of course to Peter who we talked into funding it earlier than he wanted to! Ultimately, I think this App is good for the entire spa industry because along with being able to use iPhone Apps to get the weather, find fast food restaurants, shopping centers and gas stations, now people can find places of rest and relaxation that will help their health and well-being. In the long run, I think it will help people see spas as a more natural part of their lives. Please pass on the good news!